CHARLES WATSON, M.A., B.D., T.C.D. DIFFERENT DENOMINATIONS IN THE UNION. H�reden, alterius velut unda sutervenit undam." Spa, Ballynahinch, Co. Down, N. Ireland. This letter encouraged me to gather more material for compilation, and to write the story of Glenavy Parish in a popular form. It has been the wish of the compiler to verify everything as far as possible; and to his inexperience in such work must be attributed faults of irregularity or inaccuracy in the account. 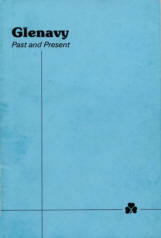 I am indebted for the general history to Cupples' Statistical Account and to Reeves' Antiquities; and I have consulted, among others, such authorities as O'Laverty's Account of the Diocese, King's History of the Irish Church, also Olden's and Pooler's ; Lewis's Dictionary, Reid's History of the Presbyterian Church, Woodrow's History of the Church of Scotland, and Smith's Lough Neagh. Thy name to thee ! Be raised to God ! The Brave of old ! And war for Right ! Are great To-day ! " That time shall cast ! May plenty crown thy Future hours ! S. K. Cowan M.A., T. C. D.
" "The Angel."(Pars. 11, c. 132, Trias. Thau., p. 147). Colgan, commenting on this passage, says : " Ecclesia Nani dicta, qu� est hodie Parrochialis Dioecesis Connorensis in regione Delmuni� in Dalaradia"; which means, "Church of the dwarf is this day a Parish in Connor Diocese." It seems clear from this that Lettir Phadruic came to be known simply as "Lettir" (the site), St. Patrick's name being dropped as not necessary to identify a spot so well known, and there is no trace of any other "Lettir" in Dalaradia except Glenavy. The Church of Glenavy can thus boast of having its site fixed by St. Patrick, of being dedicated to St. Aidan, and of being the burial-place of the three daughters of St. Comgall, who was the founder of the celebrated monastery of Bangor, Co. Down, and friend of St. Columba, or Columbcille, of Iona (horn A.D. 521, died A.D. 597). 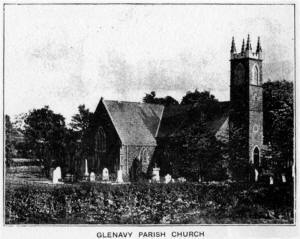 The Parish of Glenavy is now a union of three parishes�Glenavy, Camlin, and Tullyrusk. It contains 33 townlands, covering 17,890 acres, and the two villages of Crumlin and Glenavy. It is crescent-shaped, and extends nearly twelve miles in length and four and a half in breadth. On the western side it is hounded entirely by Lough Neagh, the only large island of which�Ram's Island�belongs to the Parish. Prior to the dissolution of monasteries, the Rectory of Glenavy was appropriate to the great Abbey of Bangor. After the dissolution, it was granted to Sir James Hamilton, in the patent giving him Killultagh, and thus became a Vicarage. After him it passed to Sir Fulke Conway, a Welsh Knight, who presented the living to the Rev. Meredith Gwyllim in 1622. To this Gwyllim were also given the parishes of Ballinderry and Magheragall; to all of which he was inducted by Dr. Robert Echlin, Bishop of Down and Connor, on June 17th, 1624 (Royal Visitation of 1633). The date of the Episcopal union of Camlin and Tullyrusk to Glenavy is uncertain, but from the Royal Visitation Book of 1633 it appears not to have existed then. In 1621, according to a Grand Inquisition of that date, the three parishes had only sixteen townlands, whereas at present there are thirty-three. This enables us to have some idea of the general aspect of the country in 162 r. We know that names are given to places as they become cultivated and populous. When then we read, as in Boate's Natural History of Ireland, "that there were great forests in Antrim, especially in Killultagh," we naturally conclude that Glenavy, having in 1621 few townlands, was covered with woods, and that Camlin, having more townlands than Glenavy, though fewer now, was more generally cultivated and inhabited, and that Tullyrusk was in the same condition as Glenavy. The district comprehended in the union was formerly a part of the vast possessions of the O'Neills. Before the Barons' wars in England, it was owned and inhabited by Englishmen ; and an old defaced castle belonging to them, called Sir Miles Tracie's Castle, was in existence in the year 1598. Early in the reign of Queen Elizabeth, Cormack M�Neile, called the Captain of Killultagh, possessed this country ; who, being bought off by Sir Nicholas Bagnall, deserted the standard of O'Neill and submitted to the Queen. This conduct occasioned the loss of his territories, for shortly after we find O'Neill's nephew, Bryan W Art, in possession of Killultagh, with a force of twenty horses, and one hundred and sixty foot. From his impenetrable woods and strong-holds he continued for several years to make irruptions into the English pale, and to spread terror and desolation wherever he went. His outrages at length calling for the chastisement of the English Government, he was attacked in the month of March, 1602, by Sir Arthur Chichester, then Governor of Carrickfergus ; he was defeated and driven out of his own territories, into which he had retreated with five hundred men. His followers were reduced to such extremities that they were compelled to seek subsistence by devouring each other. Seldom has the page of history recorded more deplorable scenes of distress than those endured by the unfortunate adherents of Bryan. Three children were seen feeding on the starved body of their dead mother, which had served them for food for twenty days (Biograph. Britann.). By the act for the attainder of Shane O'Neill, passed in the year 1569, the territories of Killultagh escheated to Queen Elizabeth ; by whom they were granted, with other possessions of the O'Neills, in the year 1571, to Sir Thomas Smyth and his son, on condition of subduing all rebels therein, and planting them with good subjects. In accordance with these conditions, a colony was sent over; but the younger Smyth lost his life in the attempt to establish it ; and after the sum of �10,000 had been expended, the undertaking vas rendered abortive bythe decided opposition of the O'Neills. The conditions not being fulfilled, the grants in consequence became void, and reverted to the crown. In the year 1604, Conn O'Neill, in consideration of a pardon granted to him by the King, at the suit of Sir James Hamilton, consented that these lands, with others, should be conveyed to him by letters patent. From Sir James Hamilton they passed, about the year 1609, by letters patent, to Sir Fulke Conway, at that time an active officer in the English Army. Sir Fulke, by introducing English and Welsh settlers, and with them English and Welsh manners and improvements, greatly contributed towards the civilisation of the inhabitants and the cultivation of the soil. The family of Sir Fulke Conway enjoyed the territories of Killultagh until the year 1683, when Edward, the last Earl Conway, dying without issue, bequeathed them, after the decease of his countess, Ursula, to Francis Seymour, son of Sir Edward Seymour, speaker of the Long Parliament, and the revered author of that second great charter of our liberties, the Habeas Corpus Act. This Francis Seymour was to have married the only daughter of Earl Conway, who had no sons, and the marriage settlements were prepared and adjusted. On the day fixed for the celebration of the nuptials, the lady died suddenly, to the inexpressible grief of her father and intended husband. When this melancholy event was announced, Earl Conway sent for Mr. Seymour to his bedchamber, and after deploring the afflicting incident, told him, that since it was the will of God to prevent an alliance, which he had much at heart to see accomplished, he must still consider him as his son-in-law, and heir to his estates and fortune. His will was made according to this declaration, and Mr. Seymour inherited his extensive territories�(communicated to the Rev. E. Cupples; by the Grandfather of the then Marquis of Hertford, 1814). From him the property descended in regular succession, the heirs receiving the title of Marquis of Hertford, till the death of the fourth Marquis in 1870. At his death the property passed to Sir Richard Wallace, Bart., a gentle-man who lived chiefly in Paris, and who had earned for himself a high reputation for philanthropy by his generosity during the siege of Paris. He is said to have spent �80,000 for the relief of the suffering English during that long siege. In 1890 Sir Richard Wallace died, and the property passed to his widow, Lady Wallace, a French lady. Many of the tenants have taken advantage of the "Ashbourne Act," and have bought out their farms from Lady Wallace at twenty years' purchase, a year's rent being forgiven. By this means they have at once become owners of their land, subject to the payment of principal and interest on the purchase money, which the Government supplied. At the end of forty-nine years this payment will cease, and the tenants become owners absolutely of their farms, and with no rent whatever to pay. The farmers of the parish are so respectable and intelligent, that there is every prospect the parish of Glenavy will become conspicuous for the comfort of its homes and the prosperity of its inhabitants. GLENAVY VILLAGE AND ITS VICINITY. THE Village of Glenavy suffered much in the rebellion of 1798, and for a long time was in a declining condition. The erection of a Cotton Mill, in 1808, by Dr. Forsythe, which has passed through many phases since that date, and is now a "flock" mill, the property of Mr. Hugh H. Boyd Watson, tended to revive it. This revival was further helped by the establishment of the Glenconway Bleach Green, about a mile from the village. Glenconway, which is charmingly situated, overlooking Lough Neagh, and well surrounded with trees, has also passed through many phases. Mr. Stafford Whittle started the Bleach Green, of which there were at one time eight on the Glenavy river, and after Mr. Dickson had it for a time, Mr. Dawson took it and built a Flour Mill, the water from Glenavy river and steam supplying the motor power. Burnt in his time, it was rebuilt by Mr. Hunter, from whom it passed to Mr. Kennedy; but after Free Trade was established, the business became unprofitable, and its great mill wheels are now silent. It is now the residence of Mr. S. S. Briggs. In its grounds is a fine cataract called the " Leap," composed of basalt strata, over which the Glenavy river rolls in its passage to Lough Neagh. Its perpendicular height is about 45 feet, the breadth 33, with a gradual slope of about 105 feet. The fall is broken and jagged, so that the water is fretted in its course, and after a heavy rainfall rushes with mad violence and falls to the bottom in a cloud of spray. The prosperity of Glenavy was further enhanced by the mills erected by the Lorimer family on the farms at Glenavy and Edinturcher. At the Glenavy farm Mr. James Lorimer possesses a corn mill and beetling engines, under the management of two of his sons, Archibald and Andrew, which give regular employment; and at the Edinturcher farm there is a sawmill and more beetling engines ; close to which is Eden-vale, where he resides in a pretty thatched house, on the edge of a large pond, over which swans grace-fully glide. There is no other industry about Glenavy, except weaving and agricultural employment. The village presents quite an English appearance, the houses being kept neat by the inhabitants, and in summer time, after the white-washing season, which is always before the July anniversary, looks at its best. It stands on two hills, and is divided into two parts by the river, that to the north being part of the townlands of Ballycessy, in the Parish of Camlin. Between these two parts, and at the further side of a meadow, lies by the river-side the Parish Church, the clock on the tower of which serves as time-keeper for the people. One very commendable feature of the village is the quietness that generally prevails, the absence of any rowdy-ism, and a remark which a lady once made to the writer will shew the people's politeness. On passing through it and perceiving no heads of gossips peeping at the doors, she remarked : "What a pleasure to walk through this village ! I see no curious heads peeping to make you feel uncomfortable." No religious animosity prevails, and differences of creed do not hinder neighbourly frendship. With rare exceptions, too, the people are very sober ; indeed, drunkenness is generally regarded by the people as a vice to be shunned. The tone of morality is much higher than in some surrounding districts, due probably to the salutary influence which the Rev. Edward Johnson-Smyth exercised for over 33 years ; still, there is much room for improvement, for chastity is not yet regarded as the " mother of virtues." That fairest beauty, far above the rest."�Spenser. In 1808 Glenavy had sixty-eight houses and a population of 309 ; 153 males and 156 females. In 1892 the population, counting the " Hillhead," amounts to 211, of whom 113 are males and 98 females, in 50 houses. In 1808 there were an inn and two public-houses ; the inn being kept by Mr. John Ferris. The deputy post-mistress was Miss Jane Quigley. There were also then 5 grocers, 3 tailors, 2 smiths, 1 turner, 2 shoemakers, 1 miller, 1 carpenter, 1 mason, and 3 weavers, flax dresser, 6 farmers, 14 labourers, and 1 doctor. It is interesting to compare this record with its state to-day in the matter of trades. There are two public-houses, one kept by Mr. George Ferris, the other by Mrs. Armstrong. The post-office is under the charge of Miss Maggie Ferris. There are 4 grocers, 2 smiths, 1 miller, 3 carpenters, 1 tailor, 3 masons, 1 saddler, 14 farmers; and the Physician, who is also Dispensary Doctor and Coroner, is Arthur Mussen, Esq., M.D., J.P., whose charming home, "The Cottage," stands a short distance from the village. Dr. Mussen is also the only magistrate residing in the parish; the other, Captain Dowglass, Gobrana, living since 1888 in London. On the occasion of Dr. Mussen's appointment, his friends in the neighbourhood made him a presentation, value �250, as a token of their esteem, and appreciation of his services as Physician for a quarter of a century. The village possesses a very handsome Protestant Hall, erected in 1870. It contains a large room capable of holding 500 persons, a committee room, two lodge rooms, and caretaker's apartments. Nearly opposite to it is a very ornate Methodist Chapel, built during the present year at a cost of �1,500, and surrounded with iron railings. The private house of Miss Johnston is handsome, and the Methodist Manse and the house of Mr. James Johnston are most comfortable residences. This latter house, called " Hope-croft," is at present a hoarding-school, under Mr. J. B. Bolland. The taste for improving the houses is extending, Mr. T. A. Irvine having completely renovated the houses he owns, Mrs. M`Areavy and Messrs. John and Edward Ingram having added neat porches to their homes. Glenavy is a station on the Great Northern Railway's branch line from Lisburn to Antrim, and trains travel each way four times daily. The river at Glenavy is a favourite resort for anglers, who come from Belfast and Lisburn to enjoy that recreation. There is no market or fair held in it, but in 1808 a fair was held twice a year. 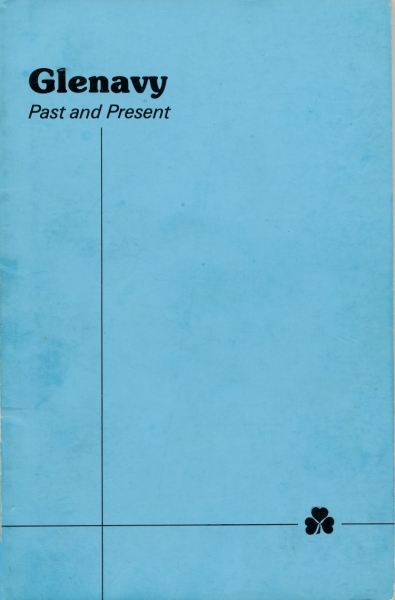 Glenavy possessed once a fine corps of Yeomanry, called the Glenavy Infantry, consisting of 148 rank and file, of which Mr. Whittle was captain, and Messrs. John Ridgeway and Daniel Allen, uncle of the Misses Allen of Ballycessy, were lieutenants. There was once a police station in Glenavy, and the barracks were stationed where Frank Colburn now lives. The oldest inhabitant in the parish is Widow Clendinning, who was born in the year of the rebellion, two months before the Antrim fight, and is therefore in her 95th year. She lives with her son, Mr. John Clendinning, near Ballydonaghy bridge, and is in full possession of all her faculties, though, owing to a fall, she is confined to her room. An Orange Hall and Lecture-room is at present being built at the Crew, through the energy of Messrs. Joseph Neill and Henry Ballance, together with the members of the Lodge. The Orange Institution in Glenavy flourishes under the fostering care of Dr. Mussen, J.P., the County Grand Secretary and District Master, and the members are a most respectable body of men. There are eight lodges in the District, the numbers and masters of which are as follows :-73, Edward Irvine; 124, Joseph Neill; 227, Dr. Mussen; 314, James Patterson; 340, W. J. Smyth; 351, J. Suter ; 471, T. Neeson ; and 618, James Bolton. The Officers of the District are :�Dr. Mussen, Master ; James Lorimer, Deputy Master ; John Corken, Secretary ; Edward Irvine, Treasurer. There are four Orange Halls in the District, at Glenavy, Dundrod, Crew, and the Mount. The District has about 300 members. The whole aspect of the country is strikingly English. Orchards abound every direction, trees are so plentiful that, from an elevation, the parish looks like an immense park, and the comfortable homes are generally prettily named, such as Holly Bank, the residence of Mr. John Corken ; Elm Hill, of Mr. T. J. Lynass ; Bellbrook, of Mr. Lucas Waring; Pigeontown, of Mr. J. Oakman; Weir House, of Mr. J. Johnston ; Crew Mount, of Mr. H. Ballance ; Hopevale, of Mrs. S. Johnston ; Ashgrove, of Mr. J. Bell ; Beech Hill, of Mr. J. Smyth ; Lakeview, of Mr. J. Ballance ; Janeville, of Mr. W. Ingram ; Bell Grove, of Mr. J. Bell ; Springfield, of Mr. Allen Bell ; Landgarve House, of the Misses Donaldson ; Landgarve, of Mr. J. M�Clure ; Fir Lodge, of Mr. M�Calister; Glenville, of Mr. R. Higginson ; Greenmount, of Miss Durham ; and "The Leap," of Messrs. Johnston. Goremount, which is a lovely country house close to Glenavy, received its name from the Gores, an old family once resident, and through the marriage of Captain Henry Alsager-Pollock to Miss Gore passed to the Pollocks, from whom it was purchased by Mr. T. Johnson-Smith, J.P., on whose death it was sold to Mr. M. Armstrong, who now resides there. Thistleborough, once a splendid mansion, and the home of Mr. Stafford Whittle, is now almost in ruins; and such is also the condition of Glendona, which belonged to the Charters family. While in religious devotion the people will never be accused of wasting their powers of soul in barren ecstasies, they are most reverential, and the fear of God exercises over them a healthy influence. There is almost an entire absence of the superstitious ; fairies are never seen, the banshee never cries, and not a house is said to be haunted. An interesting piece of statistics has been furnished by Mr. J. English. In the year 1856, there were 14 public-houses in Glenavy Parish, 6 in Camlin, and 1 in Tullyrusk. Total in united parishes, 21. In 1892 there are only 5 public-houses in Glenavy, 5 in Camlin, and none in Tullyrusk. This is a decrease of 11 in 36 years. Glenavy has contributed some men of mark to the world, prominent among whom at the present time is the Honourable John Ballance, now Prime Minister of New Zealand. His relations, the Ballances of Glenavy, are justly proud of the honourable distinction to which he has attained. Son of Mr. Samuel Ballance, of Ballypitmave, the New Zealand Prime Minister was educated at Belfast Model School, and, about thirty years ago, left for the Southern Pacific. He first climbed to the position of editor-in-chief of a newspaper. Then, elected a member of the Legislative Assembly, he became Chancellor of the Exchequer, upon which Punch remarked, "not every country is like New Zealand, which always has a Ballance in its Exchequer." Now he has attained the highest honour his adopted country could bestow, and we trust that New Zealand will leap to prosperity under his Premiership.